It's an addictive and complete game. I really like the mouse control! so simple but so effective! really love the tension of getting bigger - that much closer to finishing the level but that much easier to get hit! Yeah, that mechanic came out of trying to be closer to the theme of the Jam - worked out to be a good stress-tester! Great fun and challenging gameplay! Nice BGM too! This is so addictive and polished! the controls are amazingly sharp and the music is mind-boggling. Those are some tracker skills, Sir! I've done very little #pico8 music before, it was quite a learning curve! It was the first fast-paced song that came to mind - I've always loved it! Love how polished it looks for a game jam: title (including FIRE LOGOOO!! ), help screen, music, hiscore, but more important of course, the game! 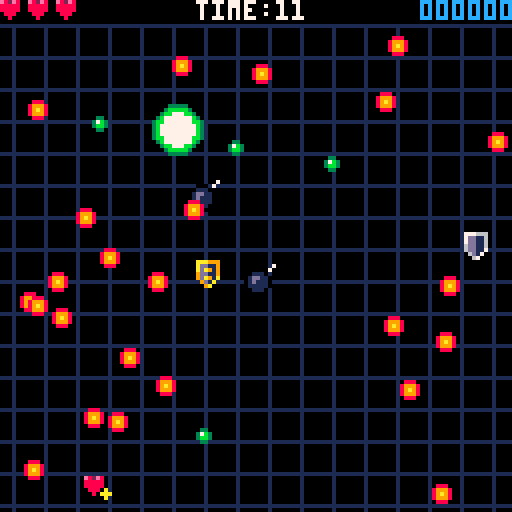 Endless gameplay based on random generation is a simple and jam-wise effective idea... I wish I had! 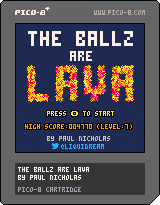 It's quite addictive, with a nice arcade look & feel "Naah I can do better than this score! 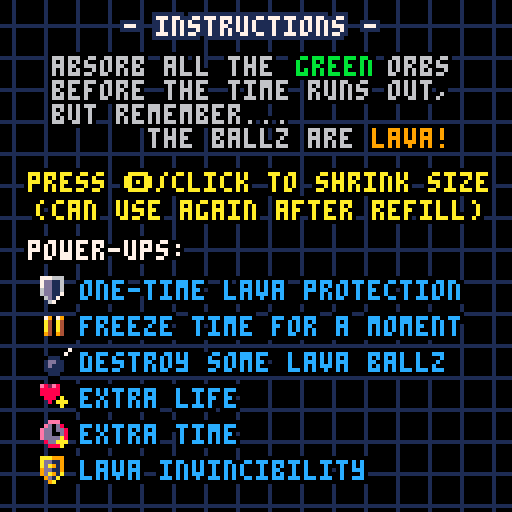 That lava ball was perfectly avoidable!". Great job! I had a lot of help with that FIRE LOGOOO!! - saw it done in a tweetjam by blokatt, which saved a lot of time! Great gameplay, simple directed and perfectly fitted with the them. Just found annoying the mouse shift at beginning of the level, (it happens if you move the mouse during countdown) it's somehow disorienting. Adding some function to mouse click (momentary shrink maybe) could improve the fun even more. Thank you very much for your valuable feedback, much appreciated. Completely agree with the jumping mouse position - good spot! Thank you very much for the kind words - very glad you enjoyed the game!